So I was looking through a folder on my desktop and my 'Home' Pinterest Board of decor I like (because the re-decorating bug is in my brain & looking is supposed to help, but it doesn't! ), I was like wow. I picked on a very evident pattern. I have a major thing for Eames. A Maj thing! Molded (Plywood or Plastic) and of course the classic lounger. I lost count at 16 and there were more...many more, le sigh. I picked just a couple of my favorites to share!!! I mean from dinning room, to living room to bedroom to office, one can't really do wrong! I need one or two or a set right?! Help me explain this to the Hubs! 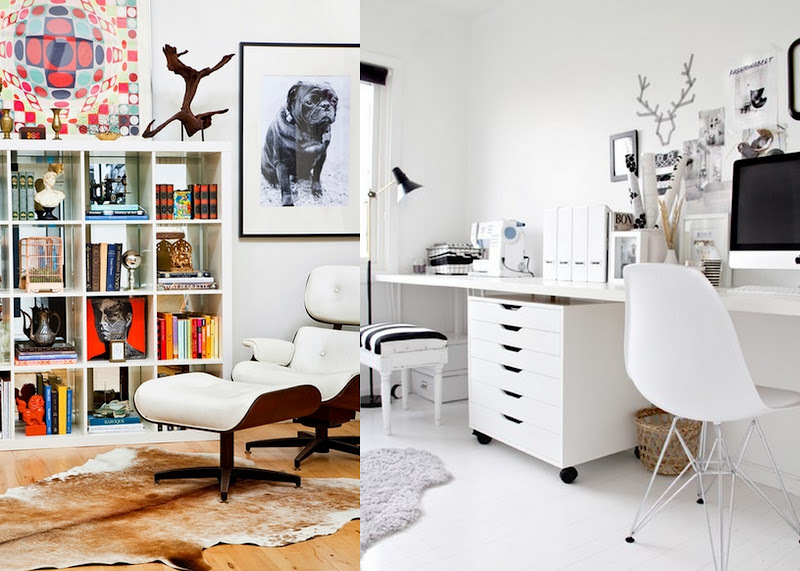 I am lusting for a white rocker - I want it for my living room and then one day (in the far future!) for a kiddo room!! Do tell, do you own one????!!?!? Vintage, reproduction or other?! Tell me all about it - let me live vicariously!!!! If you love them as much as I, you can find all styles online & various retailers - I love to test them out and oogle at Design Within Reach and Room & Board. We have a pair of those chairs. They were in terrible condition, but my husband cleaned them up and spray painted them. Now we use them as desk chairs. I love these spaces! It's almost making me excited to move again so that I can start the designing process over again! Love this inspiration. 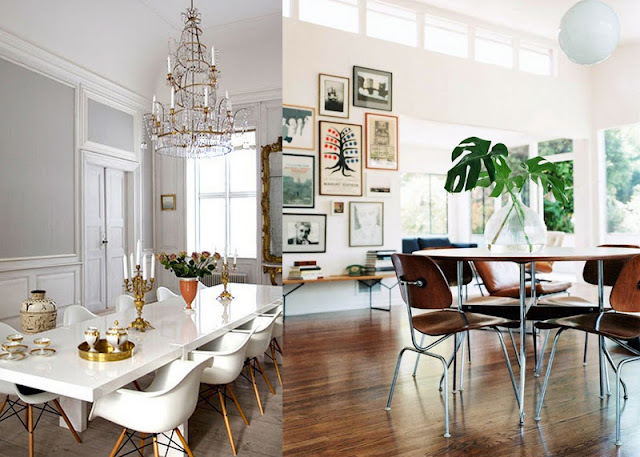 My client just bought an Eames rocker so I am living vicariously through them! Room and Board has the best ones in my opinion! I think your hubs and I should have a talk ;) And then maybe you can explain to mine why I NEED a lucite desk chair? There really are so many inspiring home pins on pinterest! I definitely have saved quite a few to recreate when I have my own place! Love the white rocker! such a versatile chair esp in white! We own a black Eames that my grandparents passed down. I am obsessed! The Eames lounger with ottoman is beyond and I can't wait to style it in my new apartment. 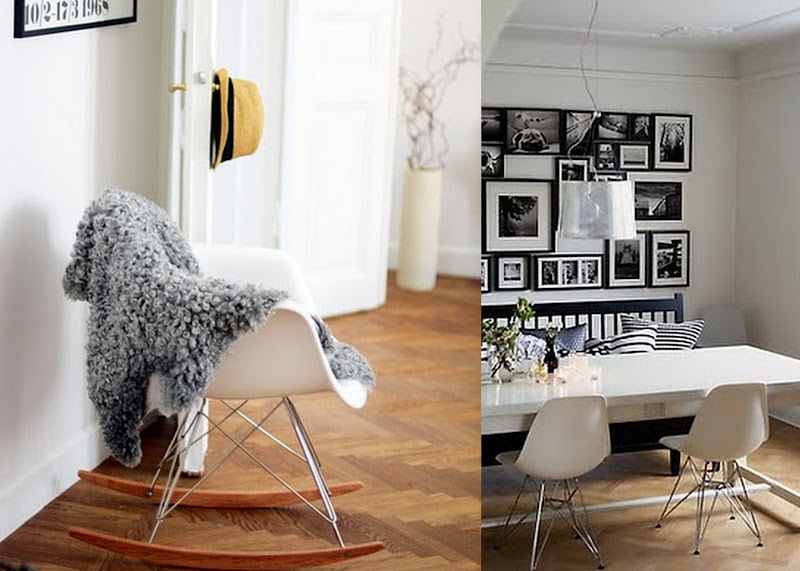 The chair must be fifty years old and it is still in such great shape and brings such an incredible aesthetic to any room. Make the splurge! I want one of those rockers too!! amazing. That rocker is speaking to my soul right now. Btw, I love how light, bright, and airy all these rooms are, too. Also lusting for a white rocker!